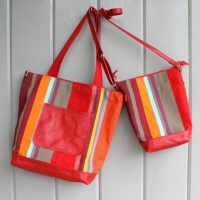 Here are two new totes for the Gallery 121 sale in early May. More details on the sale soon. The first tote is made of waxed canvas from England, the second with waxed canvas from the USA. Both fabrics are water-resistant and durable. 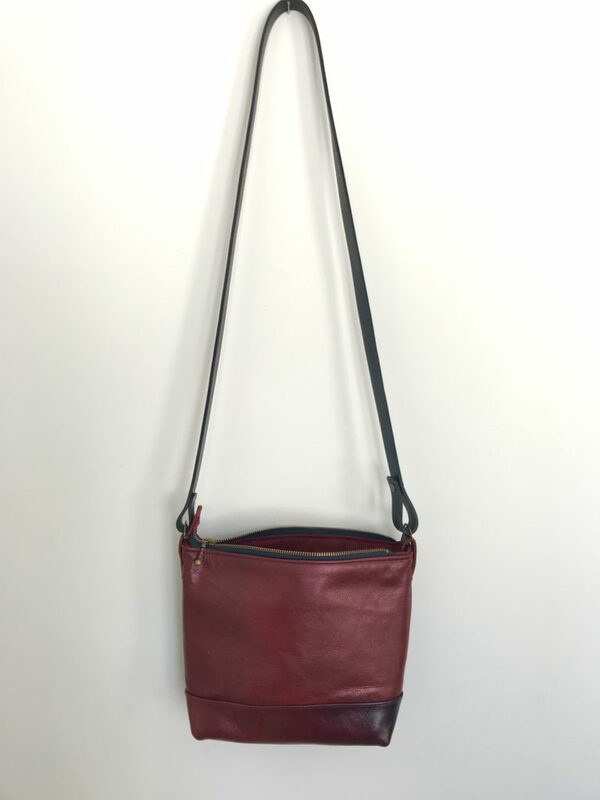 They bags have cross-body straps, are trimmed in leather and have lots of pockets inside and out. 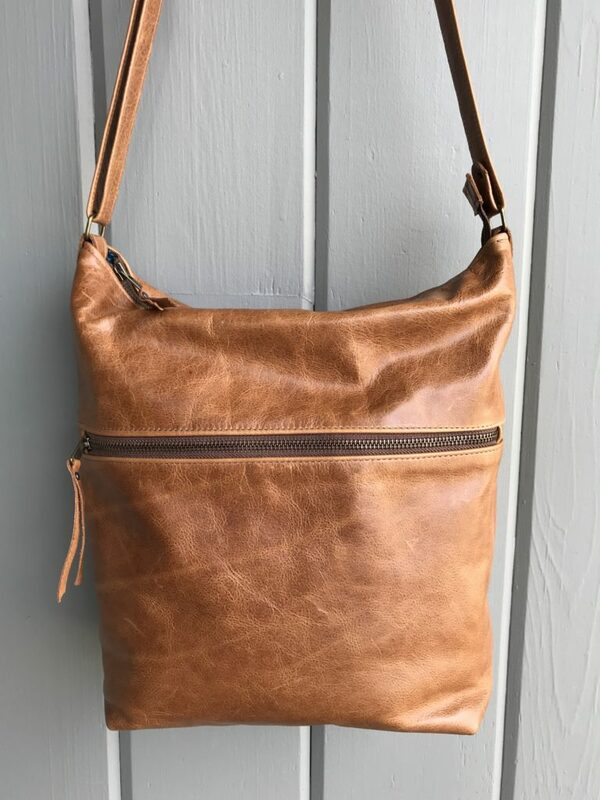 Great for travel or for everyday use. Drop me a note in the comment section if you have any questions. 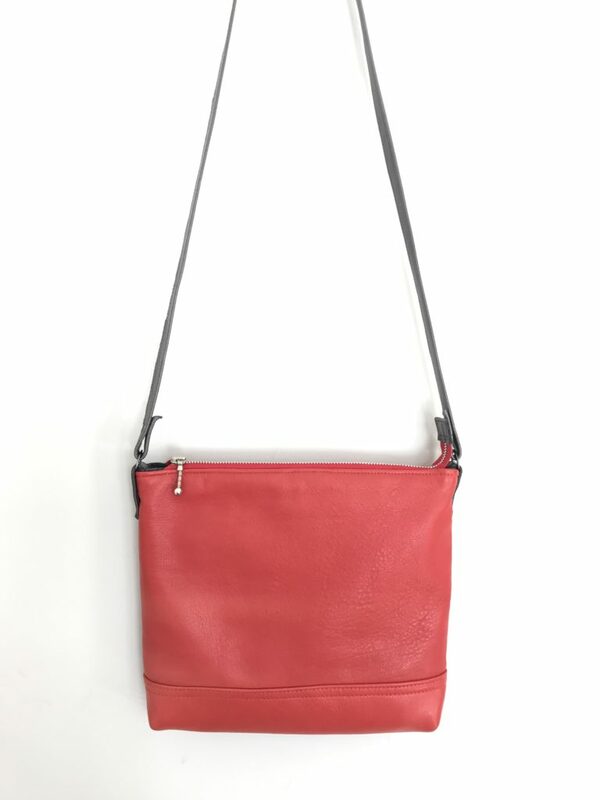 Here are two new cross-body bags, the first made from a leather vest, the second from a leather jacket. 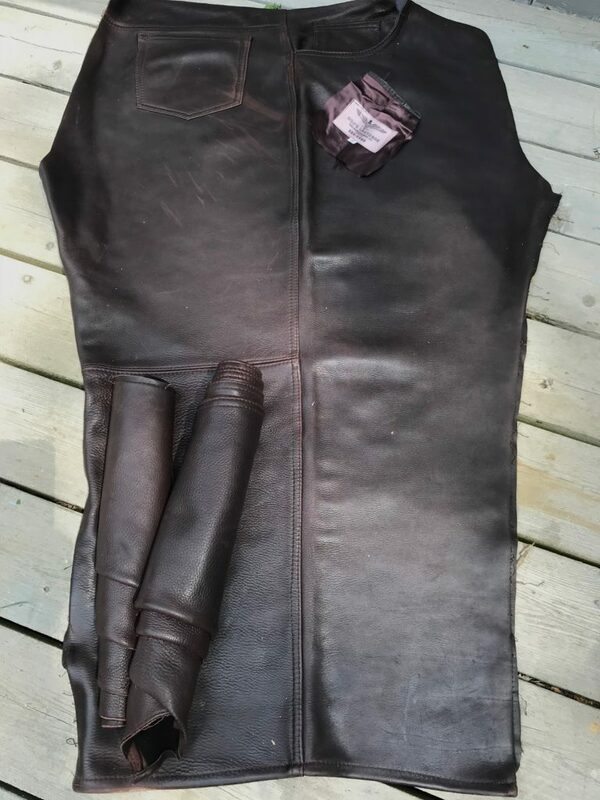 So much depends on the weight of the leather and the number of seams in the garment and these two pieces scored well in both areas. 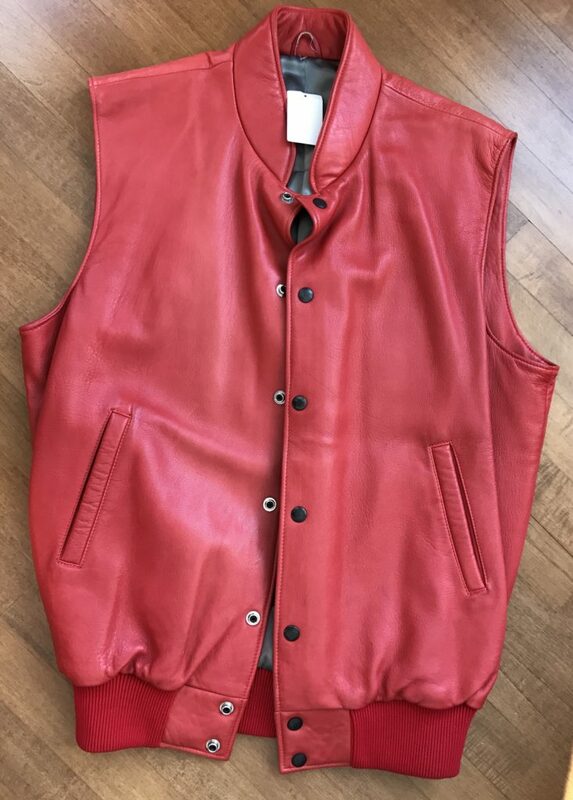 The vest was long and the back had only one seam. 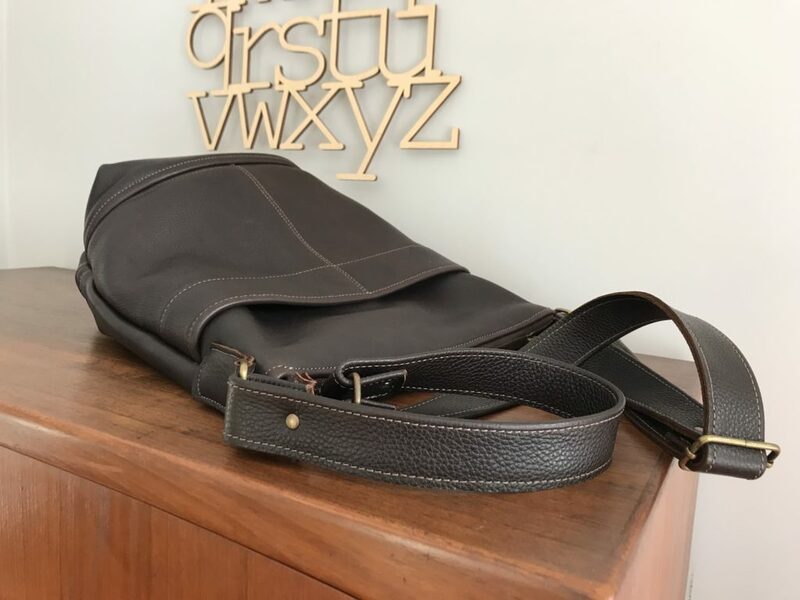 I still have enough of this great leather to be part of a second bag. 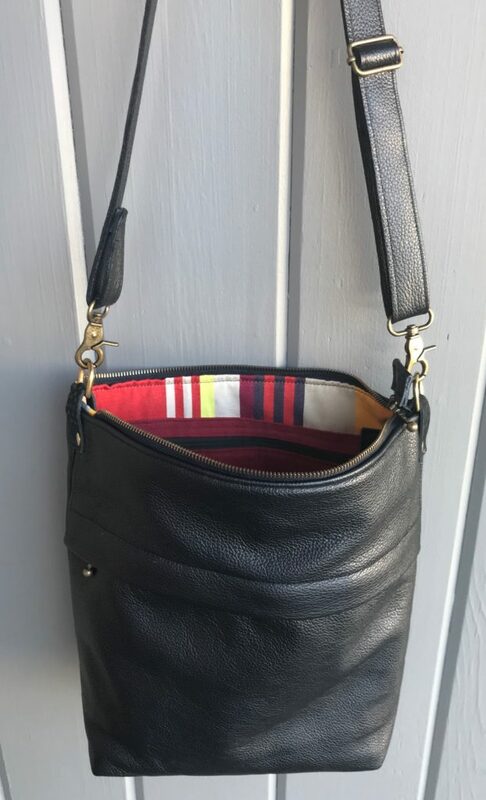 The black leather jacket had more seams, but there was still enough clear leather to make a smaller bag with an exterior pocket. 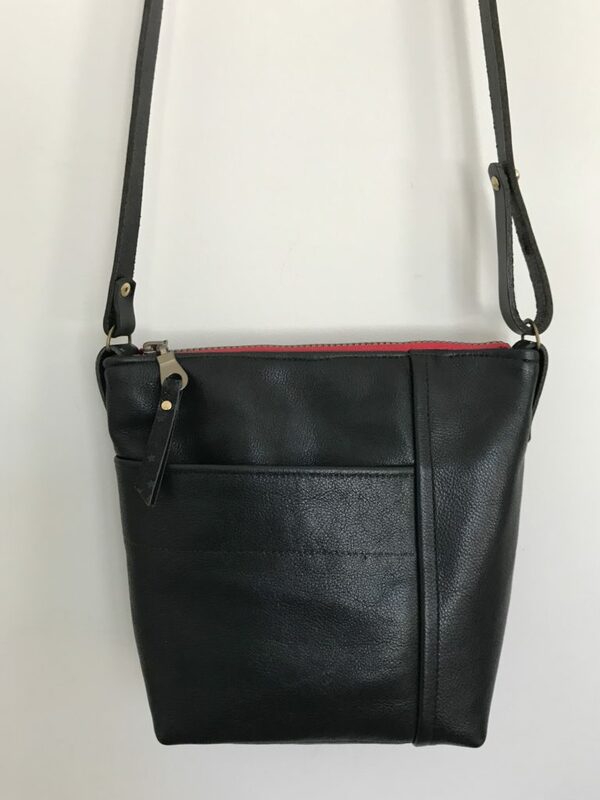 The red bag is 12″x9″x2″ and the black is 10″x8.5×3″. 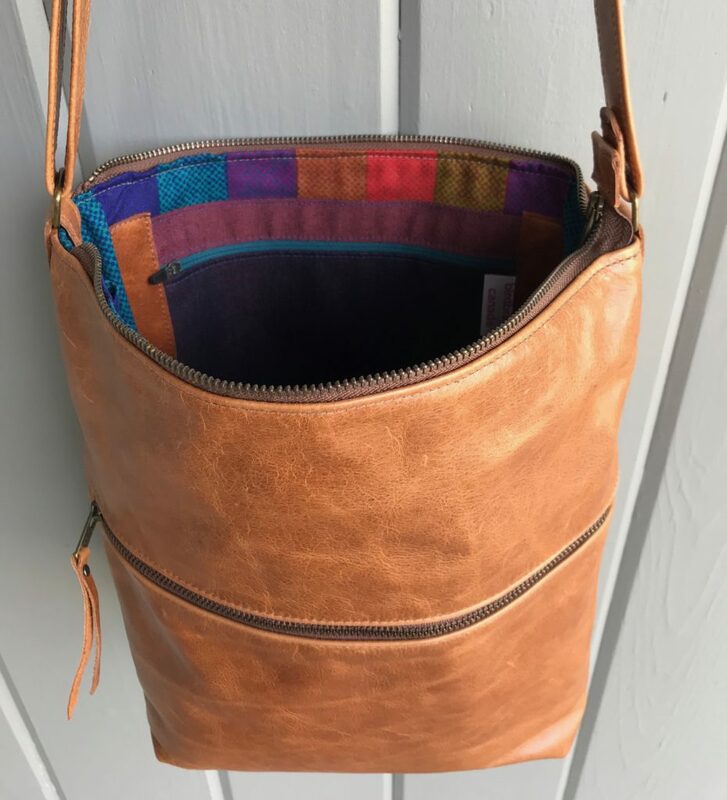 Both bags are lined with a zipper pocket inside. I enjoy giving a second life to cast-off garments. And I try to use every inch. I have plans to make pouches and small cases from the remaining pieces still left on the cutting table. 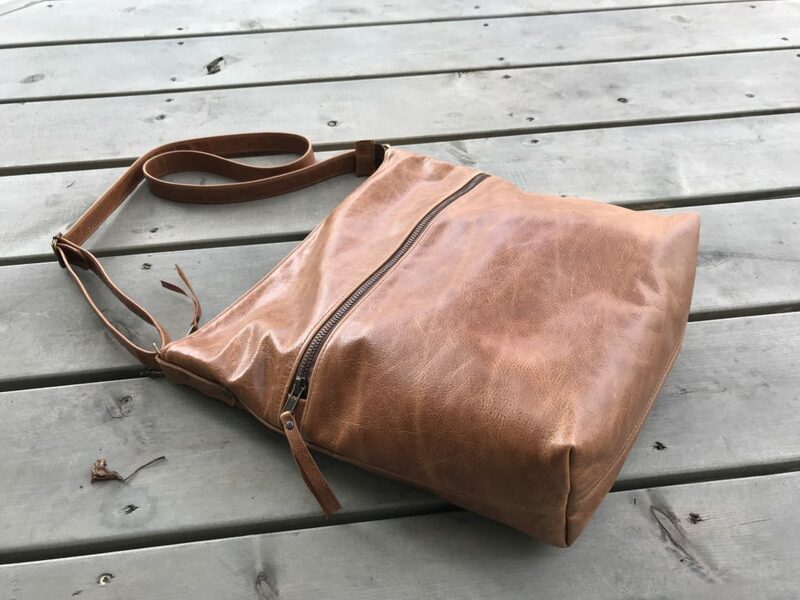 Working with recycled leather is always a surprise. Before Christmas my friend, Margaret, offered me a leather sofa that her family no longer needed. I’ve used new upholstery remnants for bags before so I was eager to see this used upholstery. 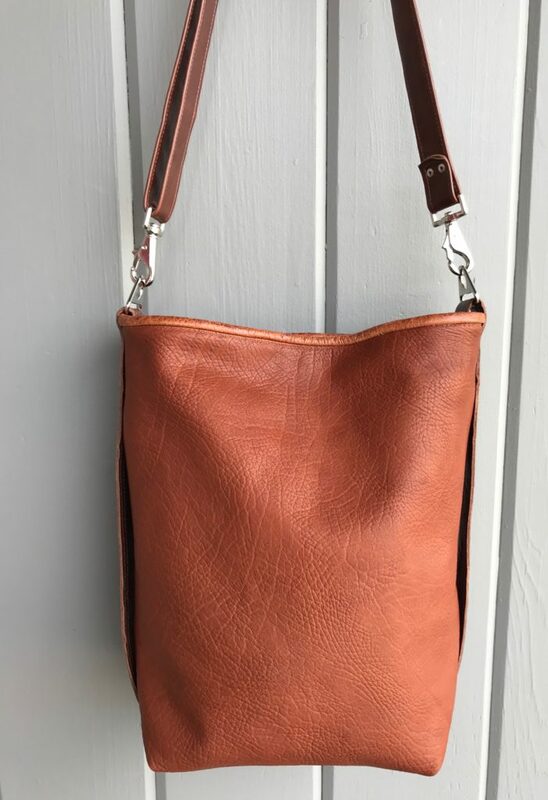 They kindly stripped the leather from its frame and Margaret delivered two large bags absolutely brimming with leather pieces. The sofa was a deep chocolate brown, but the back side of the leather was red. 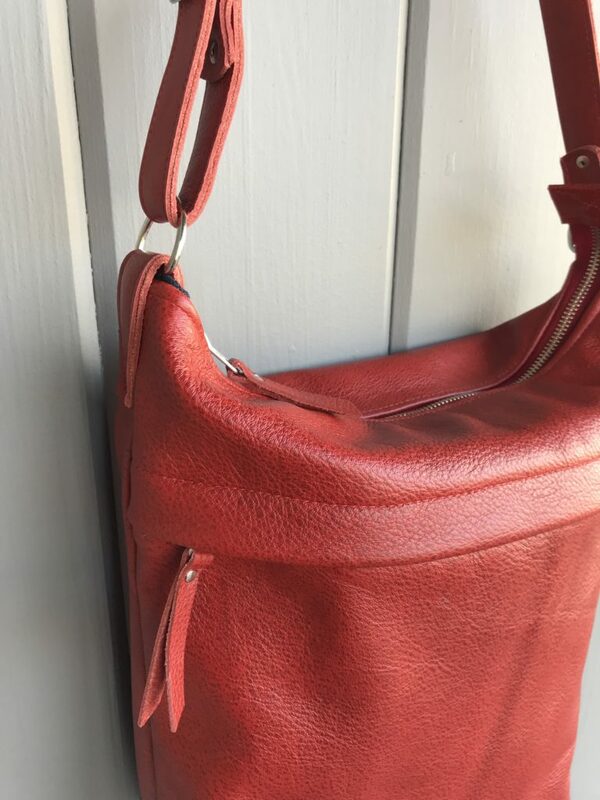 Where the leather was worn the red had come through giving the leather a beautiful burnished patina. Below you can see the first Sofa Bag. 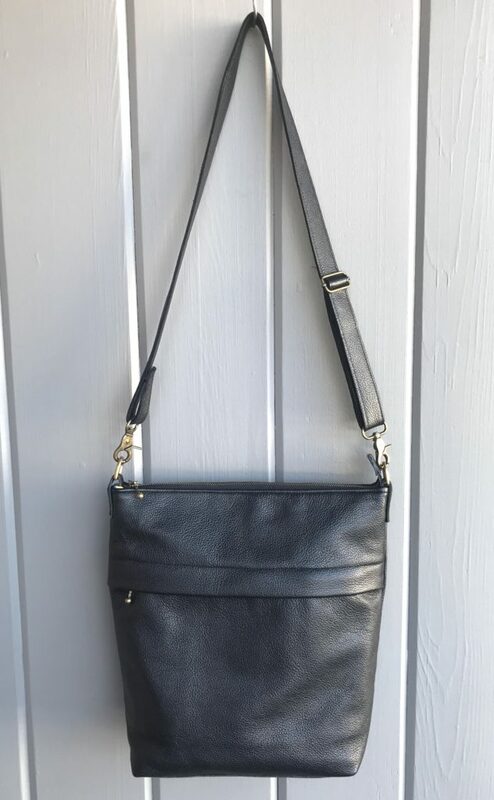 It is a day bag 11″ x 8.5″ x 3″ with an adjustable leather strap. 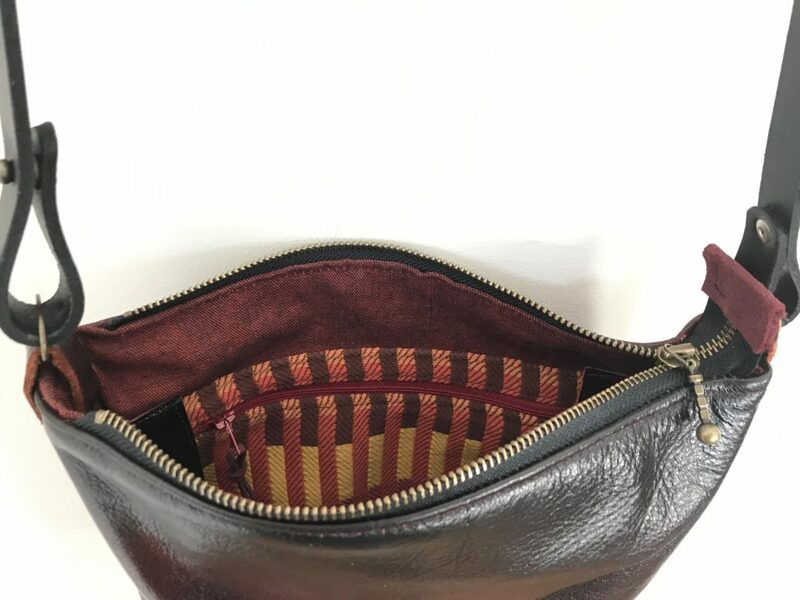 Inside it is lined with red denim from the Textile Museum sale with a zippered pocket–there is the last of that great striped upholstery sample–and a leather slip pocket. 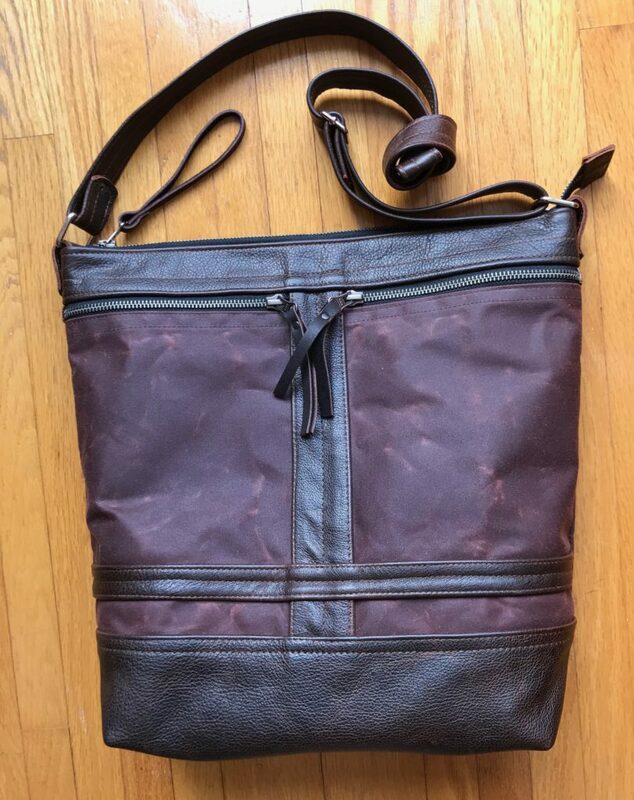 The zipper is durable metal and the low-key hardware matches. 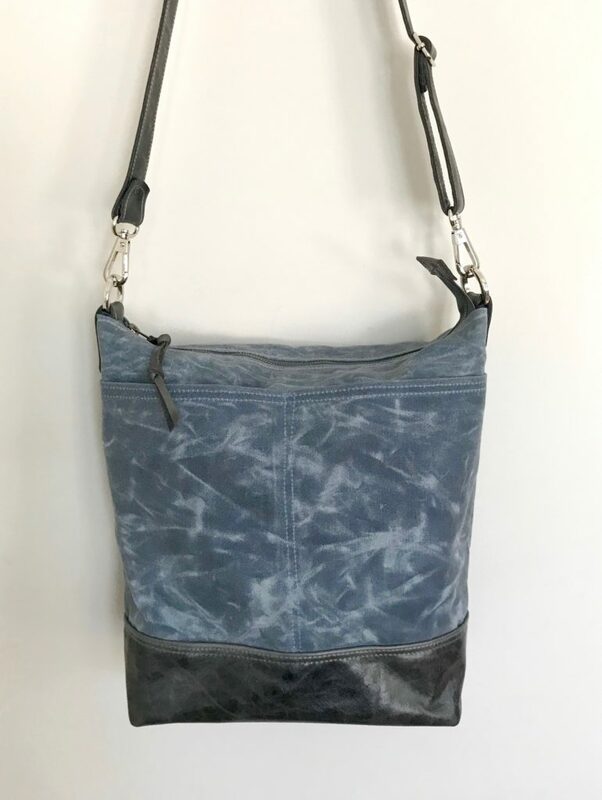 This is a unique bag, making ethical use of recycled leather and making a fashion statement at the same time. A while ago I found a pair of leather jeans in my favourite used clothing store. These are not just any leather jeans, but some that belonged to a large elegant man. 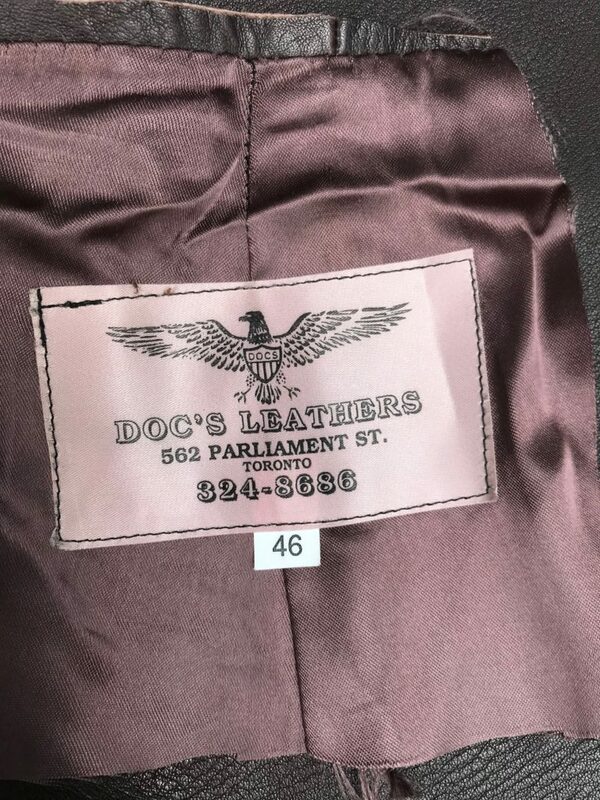 The leather is excellent quality, made in Canada, and as you can see from the label, they are BIG! I managed to get two bags from the one pair. 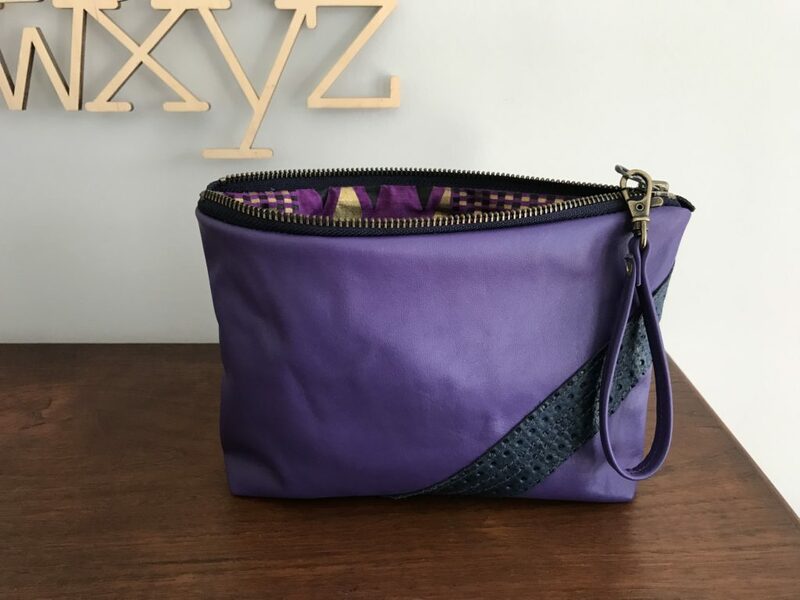 The first bag has a double exterior pocket and the second, one patch pocket. 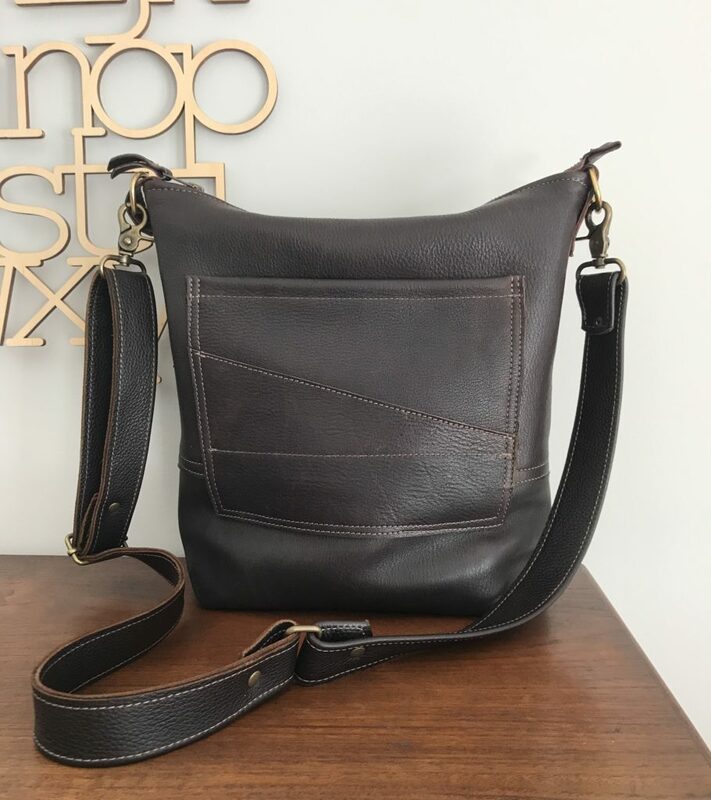 The adjustable cross-body straps came from another piece of leather but everything else is from the jeans. 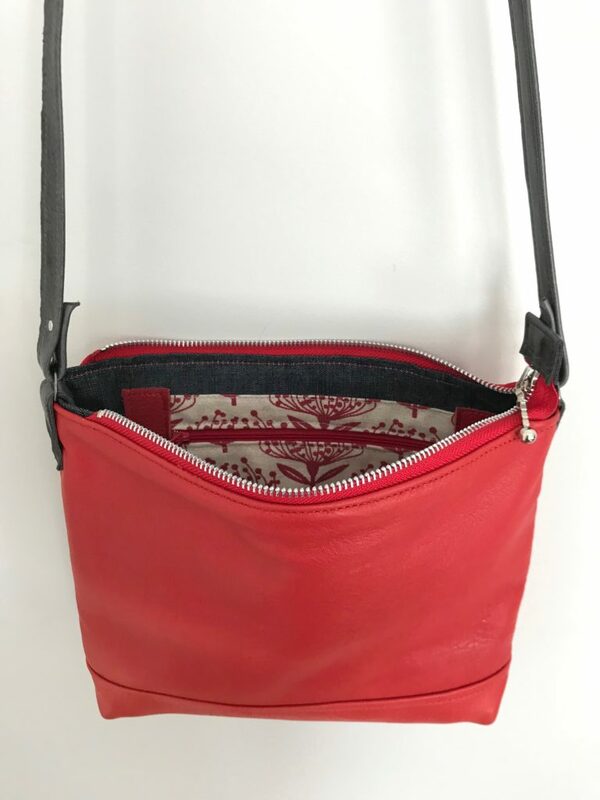 Both bags have a zippered pocket inside as well as a double slip pocket. 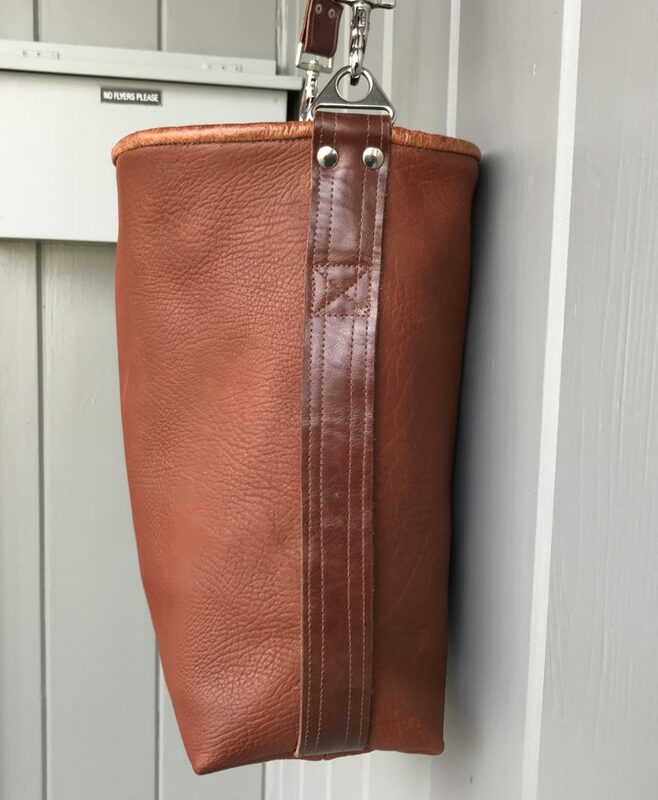 They close with a heavy duty metal zipper and have matching hardware. 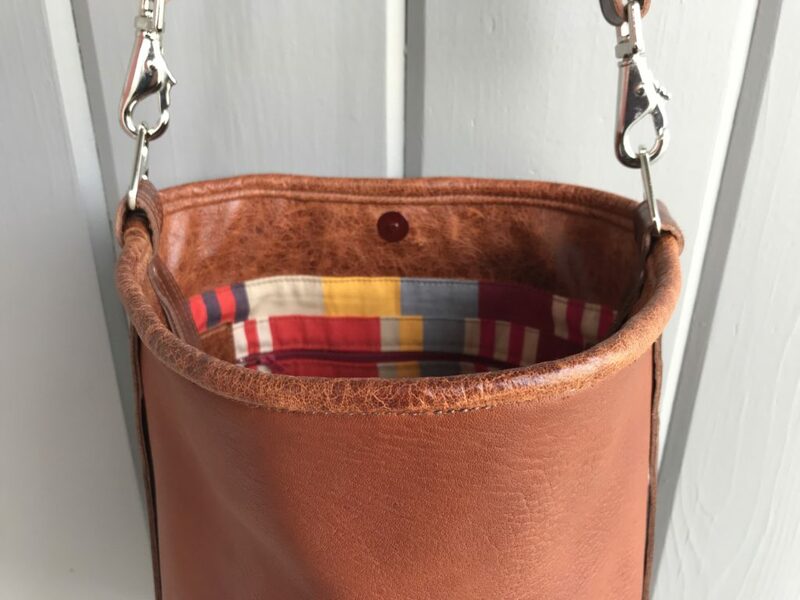 Each bag is approximately 12.5″ x 12.5″ x 4.5″. These bags will carry all you need for everyday of for travel. 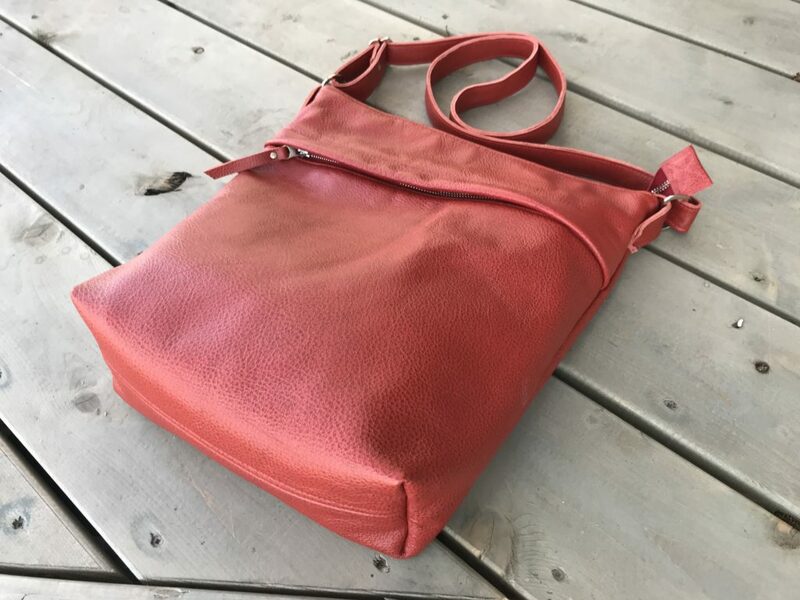 I love to use recycled leather, especially when it is of this quality. And the lining is a remnant from the Textile Museum sale, the pockets, upholstery samples. There is so much waste in the fashion business. How great to give these jeans a second and third life! 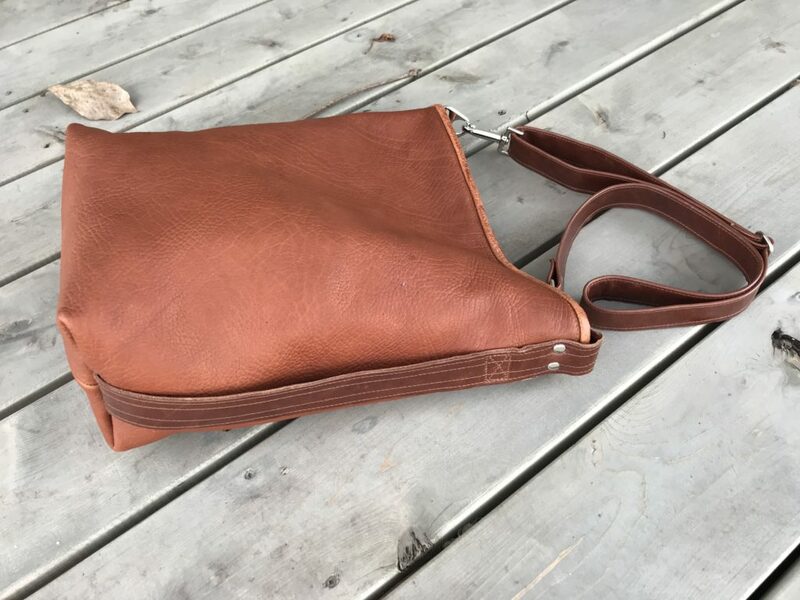 After a break from making bags, I am filling orders again. 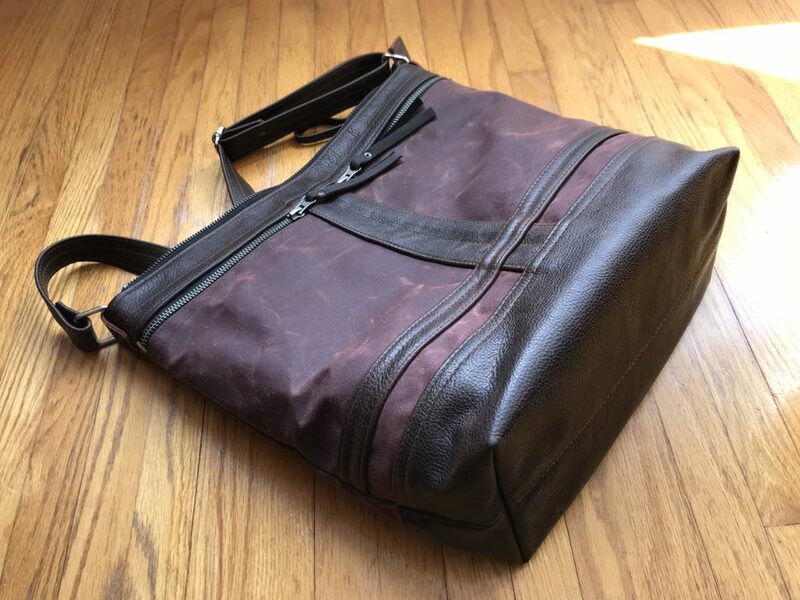 Here is an up-close look at the latest Traveller bag. 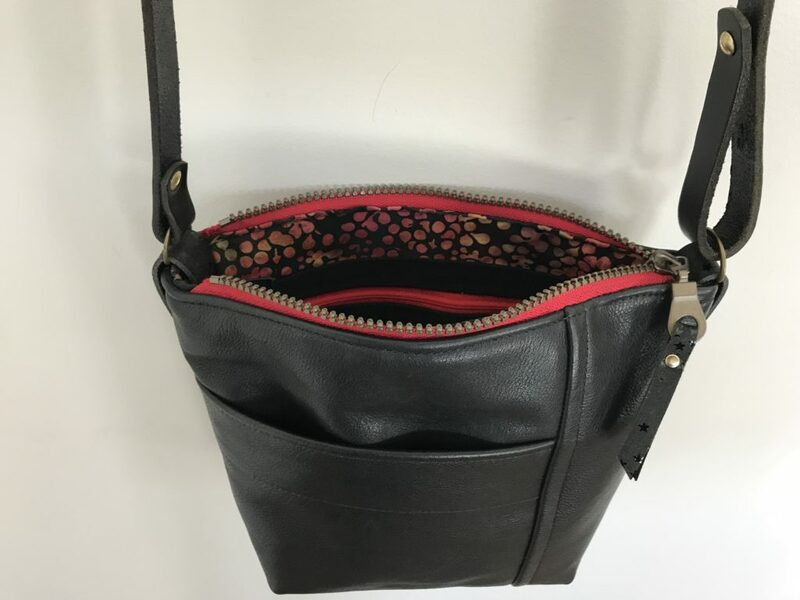 It is made of black Italian leather with a large exterior zippered pocket and several interior pockets including one with a zipper. 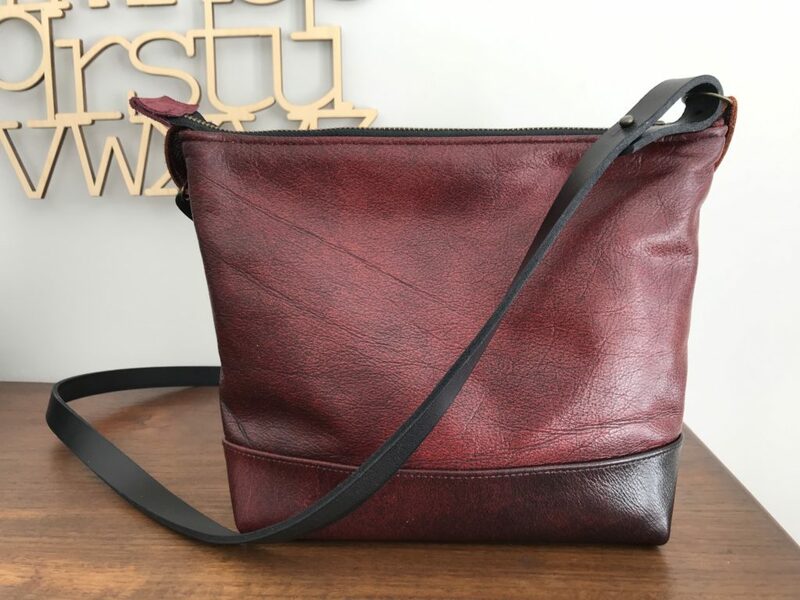 This cross-body bag is meant for travelling. 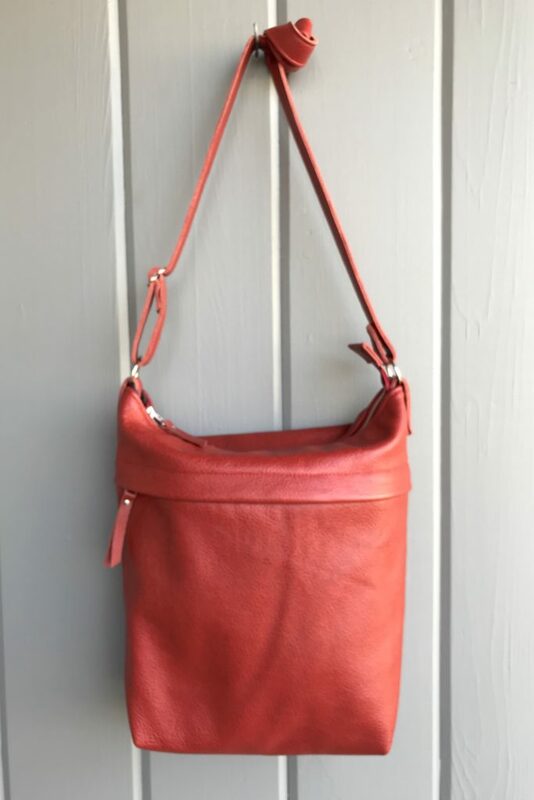 Carry it hands-free or shorten the strap to carry it under your arm. 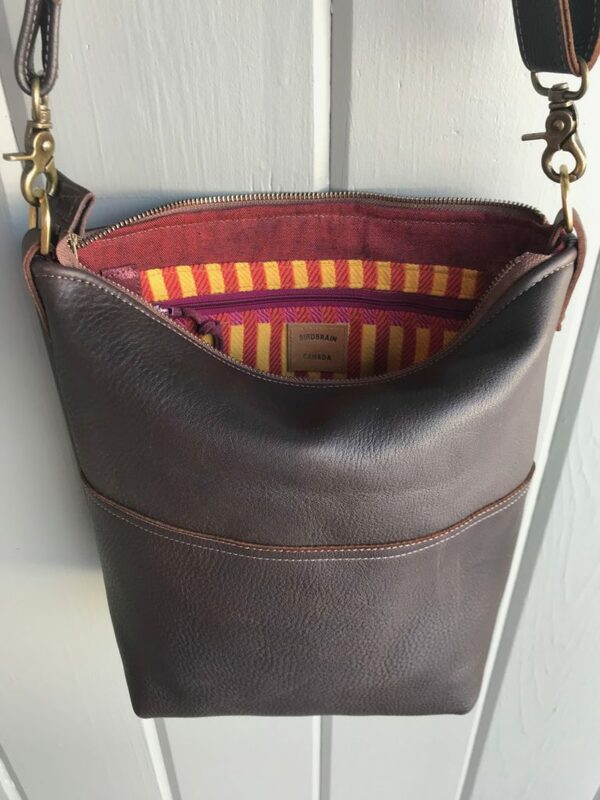 The bag has a double bottom and is lined in striped canvas. 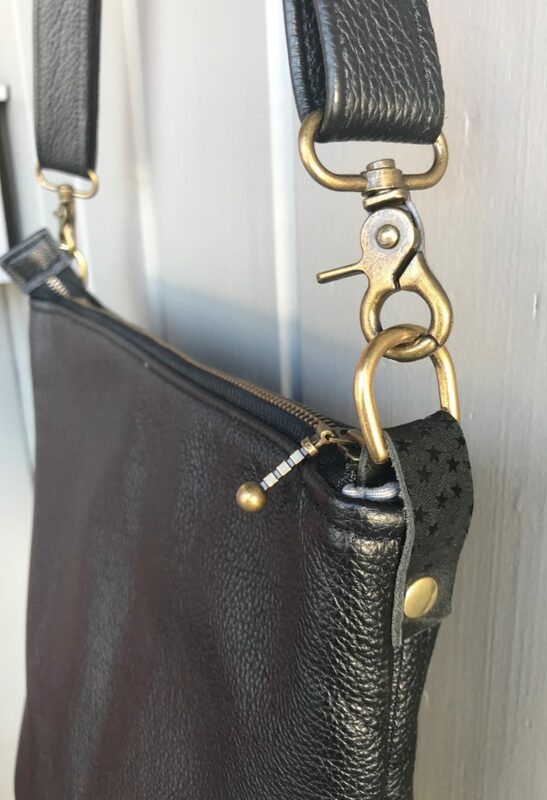 The starry leather tabs for the strap are what I love about handmade. They are made from small remnants I found on a recent trip and make me smile each time I see them. 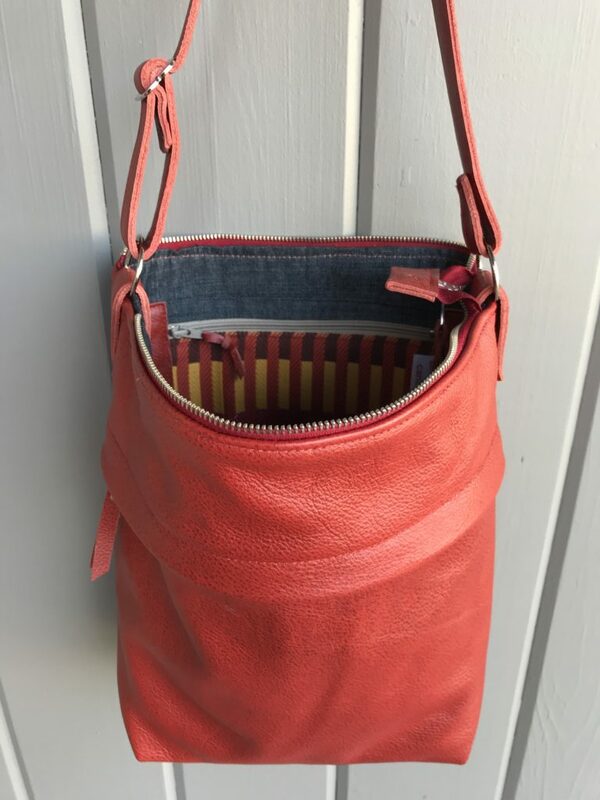 Bag is 14″ x 14″ x4″. 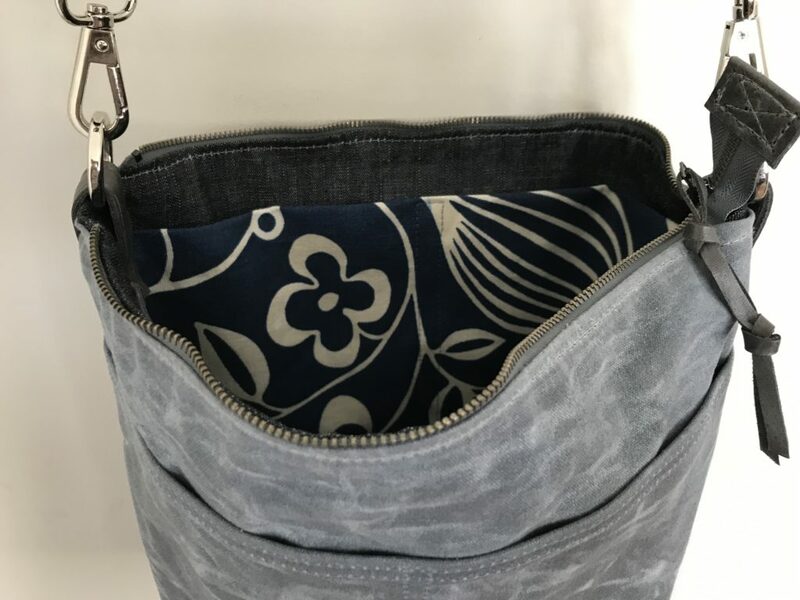 the virtuous and useful pouch–did I say they are adorable? 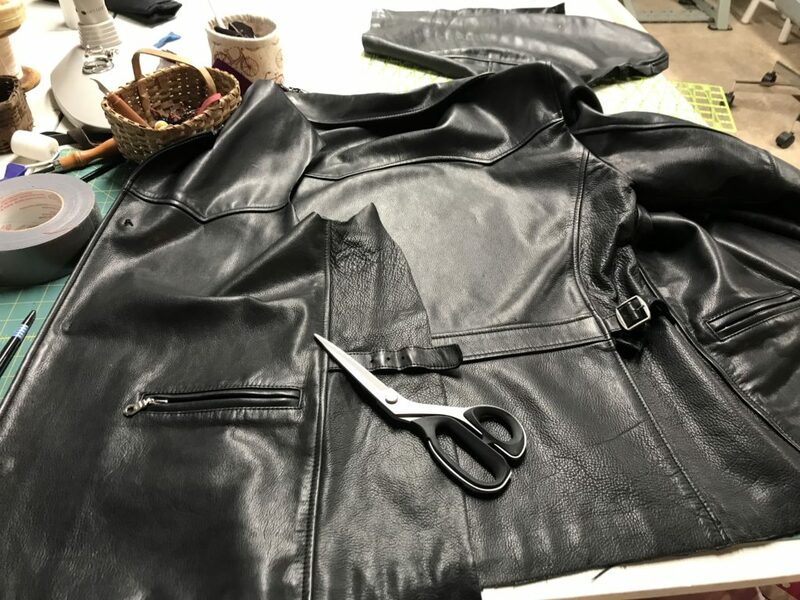 I use every inch of my leather and what’s more…I enjoy it. 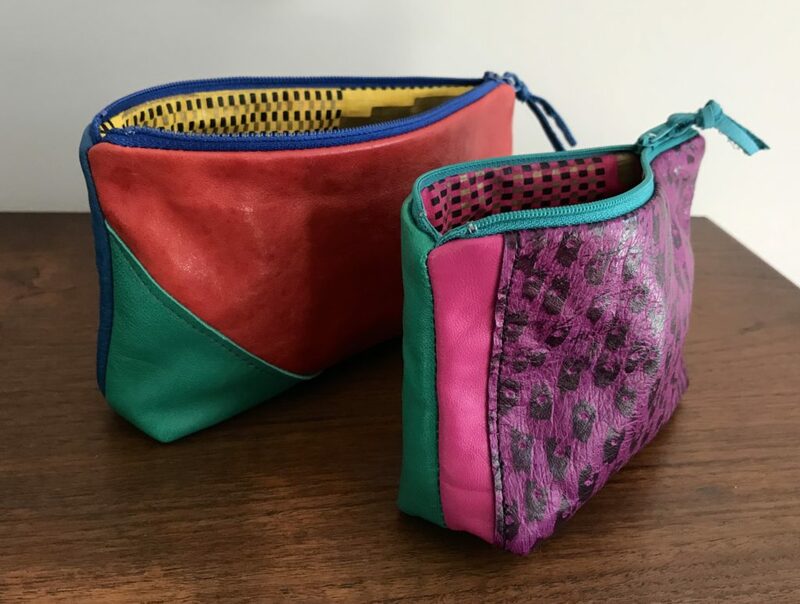 These pouches are made from recycled leather clothing–skirts and jackets–and the final pieces of my favourite fuchsia dot and lipstick red. Their inspiration was the piece of gorgeous African cloth I got at the last sale at the Textile Museum of Canada. You can see it peaking out in the first photo. Pouches have all sorts of uses. When I travel I always have three of four with me. The small ones are to store different currencies and to keep track of my receipts. The bigger ones are for makeup or pencils/notebook. 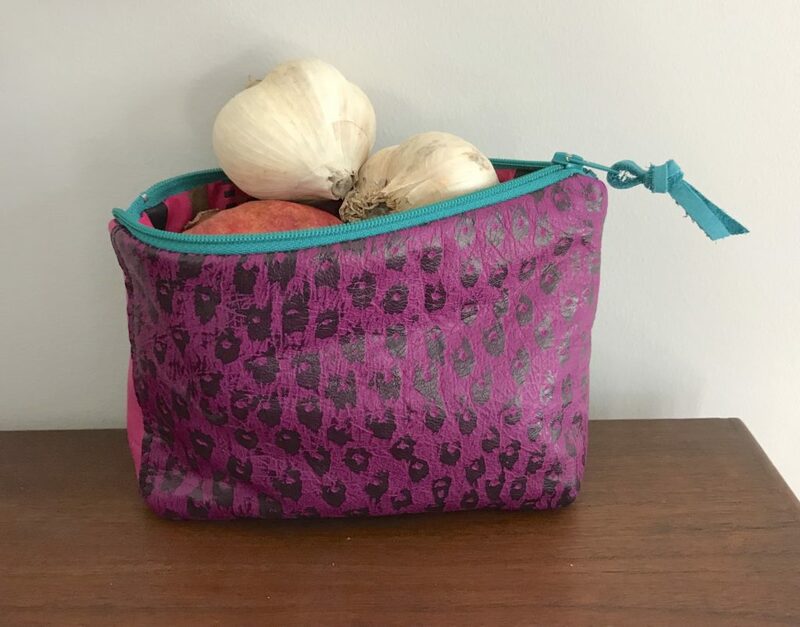 These pouches have a beautiful texture and that alone could justify their existence–but their virtue is their usefulness and their environmental quotient. Check the online store if you would like one. It has been over a month since I’ve written here. What was once a daily adventure for me, writing my blog and connecting to readers, has become a rarity. As I’ve told you before I’ve been posting on instagram and enjoying the connections and inspiration there. It’s quick and fun to hear from others and see what they are doing. Slowly I’ve been giving slow stitching, sustainability and reducing waste more and more thought. So, it’s time to share some of my musings and projects. Several years ago I was on a cycling trip in Austria when we came upon the Geiger mill. Geiger, like Marimekko, is a brand I have loved since my teens. I was thrilled to visit the factory and to purchase some remnants. You can see the blog post here with the photo of the pile of beautiful boiled wool remnants. 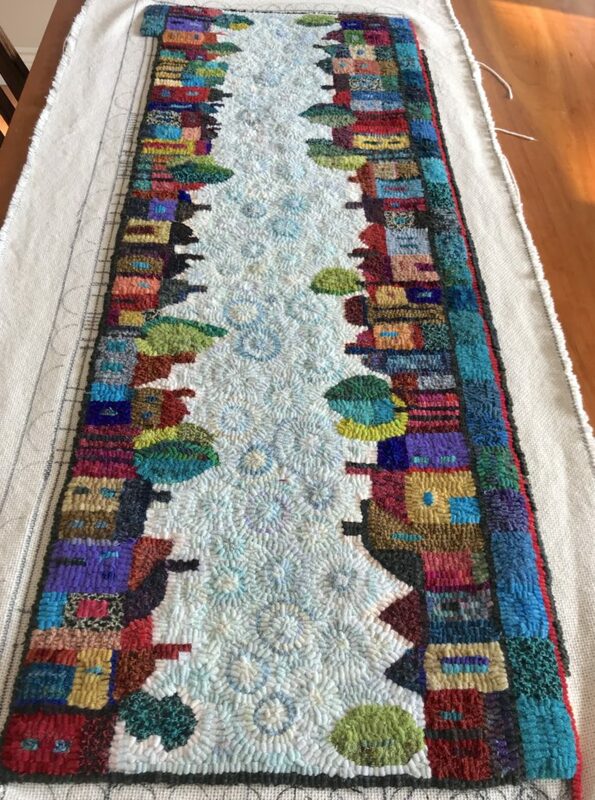 I’ve been sewing in the last year, using remnants from my bins and the Textile Museum sales. 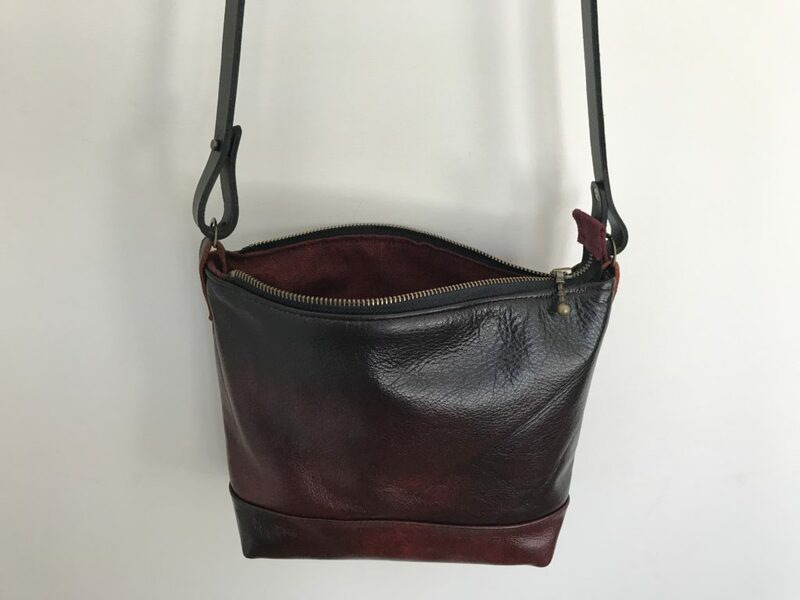 (I line my leather bags with the off-cuts I find there.) There was a time I sewed all of my clothes, actually wove the fabric first and then sewed. But then a career and a family intervened. I sold my looms and packed up my sewing machines. 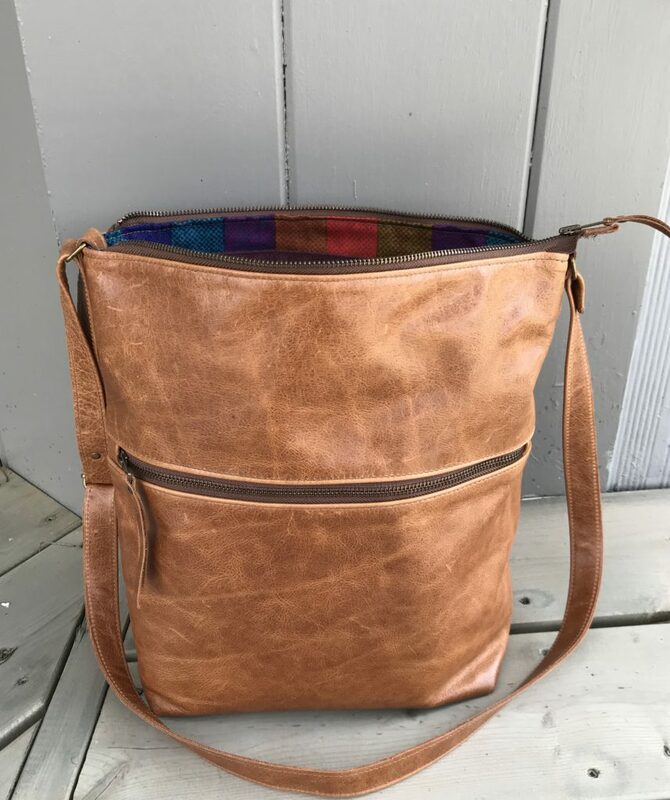 After I retired I started rug hooking and then making leather bags. And then over the last couple of years I started slowly to make some of my clothes from the remnants I had on hand. One of the big differences now is the global sewing community available online. 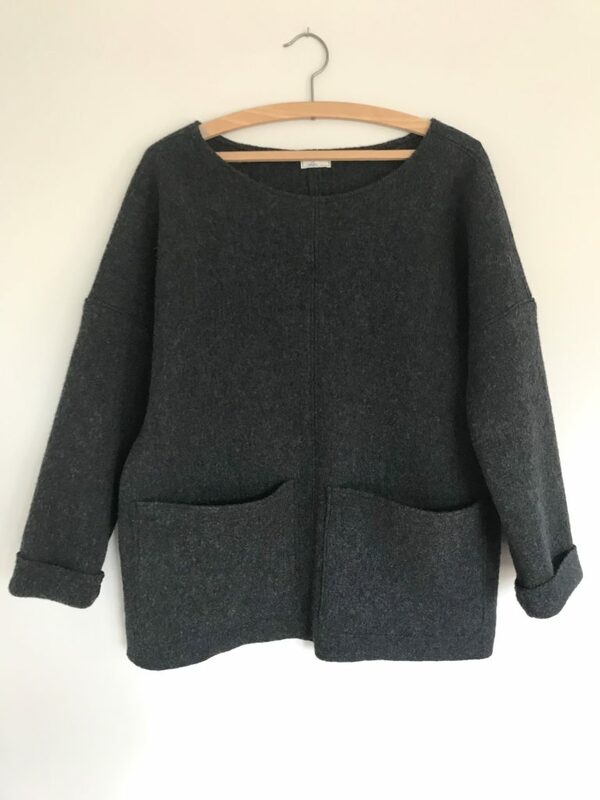 Below are two pieces I made from a pattern designer in the UK, Tara at Paper Theory, using her versatile LB Pullover. I encourage you to read Tara’s reflections on ‘slowing fashion down’ and buying ‘ethically’. I’ve written here before about my principles of buying second-hand or handmade from local artisans. This year I have added to that by beginning once again to make my own fashion using recycled and remnant fabrics. I hope you’ll follow me here on my journey. 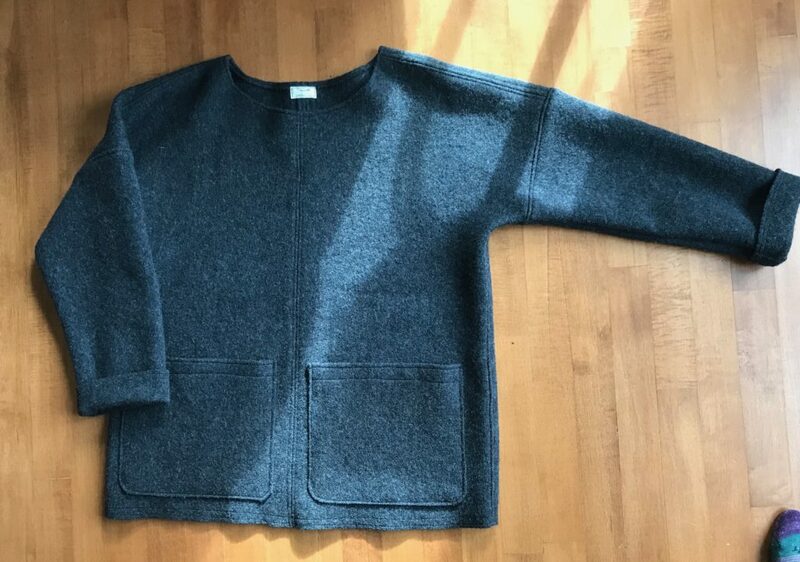 The tops below are from the Geiger boiled wool and I’ve been wearing them non-stop in frigid Ontario January. 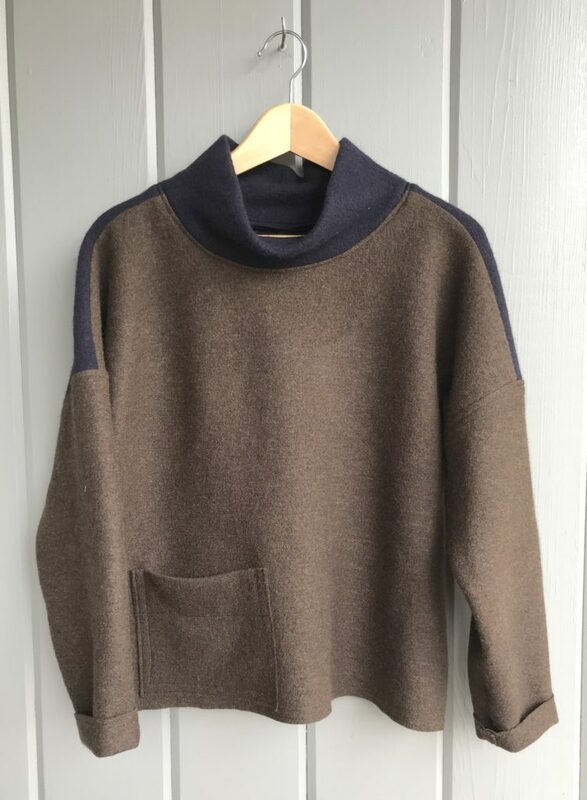 The pattern used is Paper Theory’s LB Pullover. 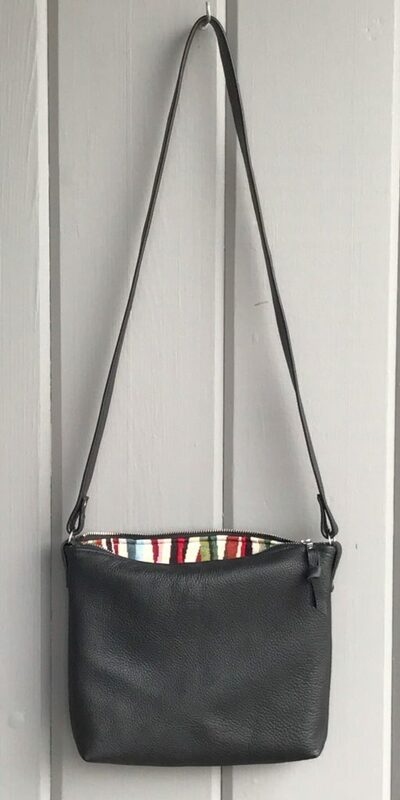 And below is a new day bag for an order. 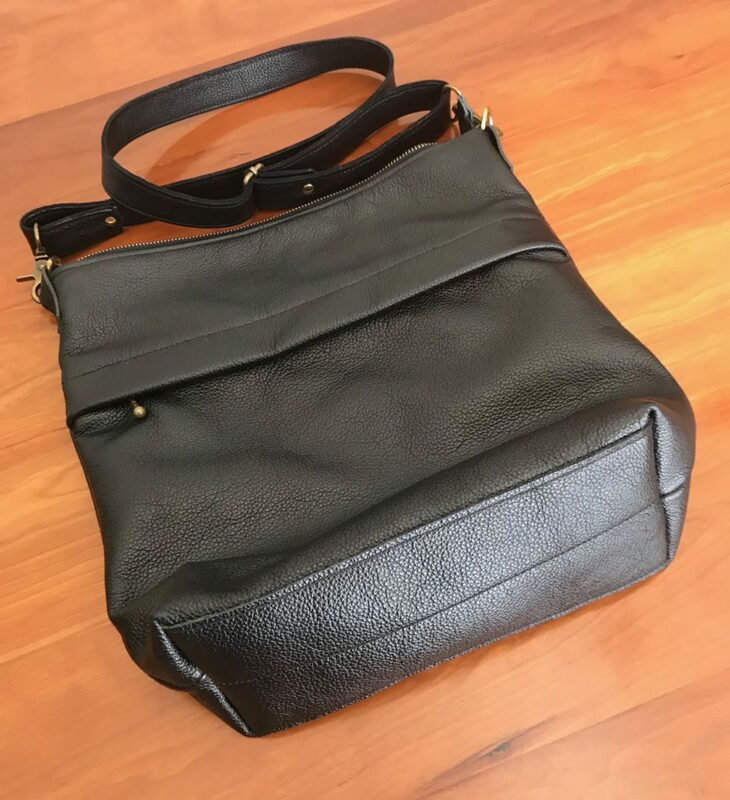 It is made from a recycled leather jacket. 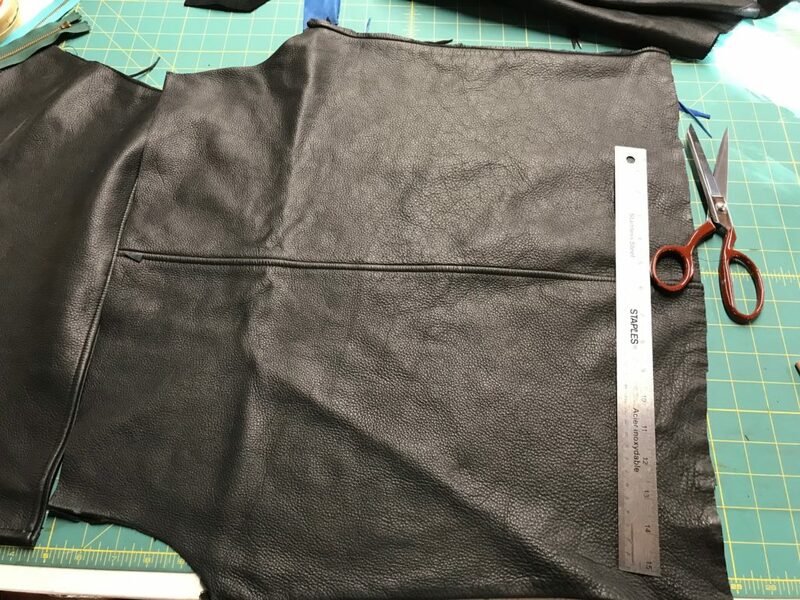 The first photo shows the jacket before being cut, the second the finished bag. 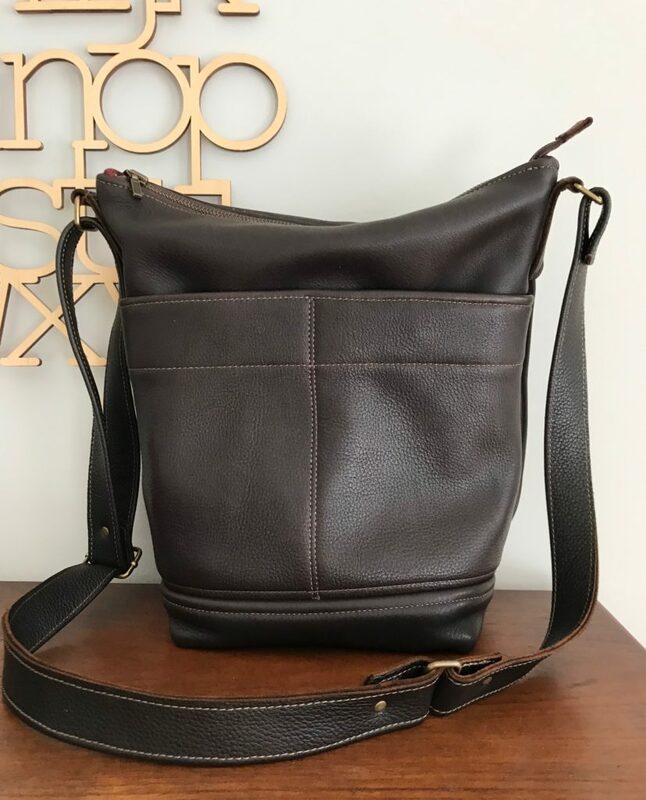 The quality of the leather is high and it was a pleasure to sew with and to give it new life.